Colombia is the second exporter of flower species, the third largest coffee producer in the world, the first in Latin American coal reserves and in the first in production of emeralds in the world, and now, that peace has arrived in this country, the quality of life is improving, entrepreneurship is being encouraged, small and medium enterprises are projected to grow in small cities, and the country has already begun to grow in industrial, social and cultural terms, demonstrating that there is a little left of the image of war that it has had. In 2016 during the peace process, according to figures from “La Revista Dinero” in its digital version, the construction sector grew 4.1% and obtained more than 1 trillion Colombian pesos (330 Billion USD) in profits and the manufacturing industry and financial institutions registered profits of just over 2 billion Colombian pesos (660 Million USD), and according to data released by the Banco de la República, FDI in the country grew 15.8% over the previous year, transport, agriculture and manufacturing surpassed the investment in 32%, also it is interesting the 122% increase in the electricity sector and 46.5% in communal services, and that Bogota, the Colombian capital, was positioned as the third city in Latin America that more generated direct jobs (approximately 5,000); confirming that Colombia is one of the most economically stable countries in Latin America. Today, estimates predict that foreign investment will triple annually and reach USD 36 billion, compared to the USD 12 billion that come today. 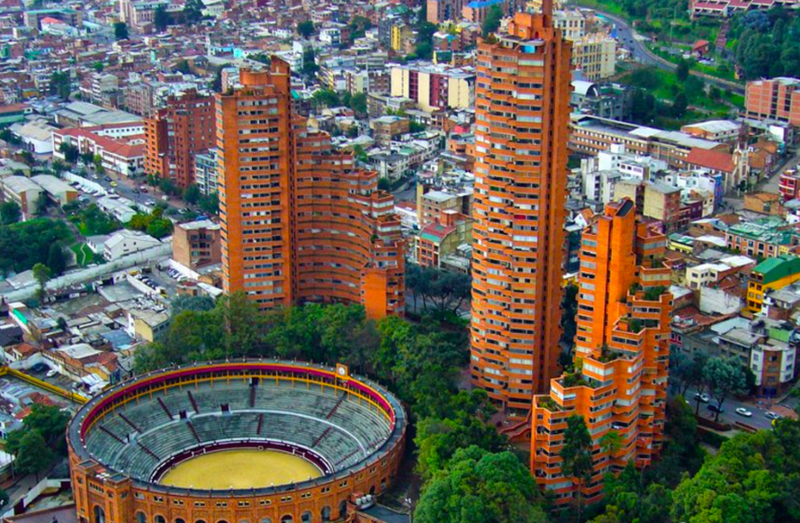 According to a DNP (National Planning Department) study, per capita income for Colombians would double in a decade from USD $ 6800 to USD $ 12,000, and economic growth of 1.1% and 1.9% annually, which means that in the coming years there will be a rebound in the sectors of construction, agriculture, tourism and industrial. Figures released by the Banco de la República show that FDI in January of 2017 grew more than nine times compared to the same month in 2016, and between January 1 and August of 2017 FDI increased by 13, 5% compared to the balance a year ago, when it totaled 2,928 million dollars; foreign trade compared to the same quarter of 2016, in 2017 rose by 3.7%. In the country, there are currently 443 franchises of both national and foreign origin, 47 in the beauty sector, 67 in specialist trade, 27 in training centers, 158 in food/ gastronomy (catering), 74 in fashion and 70 in the service sector. There are 196 franchises of foreign origin that are currently established in Colombia, whose main country of origin is the United States, followed by Argentina, Brazil, Spain, Mexico, among others, in health and beauty, fashion, food/gastronomy and catering. The franchise industry in Colombia has been booming for a couple of years, and this is mainly due to the fact that there have been various franchise projects promoted by public and private entities that have made this model known to the colombian population, in fact, the model of microfranchise for Colombia was developed thanks to an IDB project, where some colombian consulting firms developed the operational and process standardization part of that model, and it was established that microfranchises in this country would differentiate from the conventional franchises in the fact that they would not exceed an investment amount of more than 75 million pesos equivalent to USD 25,000 approximately. This amount is ideal for small and medium sizes investors. This might be an international or domestic franchise, but in other formats such as corners or small modules or mobile format unit franchises, requiring less investment. To encourage the development of franchises in general, Franchise World Link would promote knowledge about franchising. Franchise World Link would help entrepreneurs who are interested in investing in Master franchises, Regional or Multi-Unit Franchises, and eventually creating alliances with different public and private entities. Created in 1982, is the leading messaging company in the country, with a presence in Ecuador, Peru, Spain, to name a few countries. Began to franchise in 1991, in this moment has more than 3,000 premises, having achieved great positioning in the country. Created in 1987, the business idea is the design and commercialization of briefcases, accessories and clothing mainly for young people. It is one of the most successful franchises in the country, with presence in more than 40 countries, and 600 physical stores mainly in Latin America, 272 of which are located in Colombia, one of its largest projects in entering to the United States. As a franchise, it offers assistance in the area of marketing, profitability and the security of investing in a solid and recognized brand. Created in 1978 by a Cuban settle in Cali, Colombia, was born as a small establishment selling sandwiches, in 1994 they opened more premises in that city, and for 1998 they granted their first franchise in Barranquilla, today they expanded their catalog of foods and also offer fast foods, salads, desserts, among others. at the moment it has 217 commercial establishments, only 9 are own and the other are franchises, also has presence in Panama and Miami. Originated in 1950, and dedicated to the marketing of food and coffee products, it became a franchise in 2002. Currently, it has 300 stores worldwide, most located in Colombia, and in the country opens approximately 2 stores a month. Its franchises are part of the International Franchise Association (IFA), this association accredits experts in the franchise industry and endorses the services presented by the institutions belonging to that association. At the end of the first half of 2017, it invoiced more than 140,000 million pesos in Colombia. Franchise of Costa Rican origin, produces and sells fruit juices and vegetables in Colombia. Their key success factors are the original catalog of drinks they offer, the natural and nutritious concept, the location of their sales points and the quality of the products they work with. Arrived in Colombia in late 2012 and early 2013, invoiced 100,000 million Colombian pesos in 2016, and exceeds 500 points nationwide. This franchise of American origin born in 1965, with a presence in 110 countries, offers sandwiches, cookies, drinks, breakfasts, among others, in some countries by cultural and religious impositions it changes its menu. In Colombia it landed in 1997; currently has 300 franchises in the national territory, and is present in 36 cities. The franchise of Spanish origin, born in 2011 and offers non-invasive aesthetic services such as laser hair removal, facial cleansing, body treatment, among others, in Colombia arrived between 2012 and 2013, and in less than a year of operation had 40 establishments, currently has more than 70 premises, and its success in the country is due to the low prices of its treatments, and the training and constant advice to its franchisees. For the next few years the arrival of various foreign franchises from all continents and the expansion of local franchises to other territories of the country previously unoccupied. One of the most anticipated franchises in Colombia this year was H & M, that arrived in the country in May of 2017, and expects to open more than 400 stores. Other franchises that will arrive soon in the country, and that are partners of Franchise World Link, such as B.GOOD, of american origin, with its concept of organic and healthy fast food sees in Colombia the first destination country to enter the Latin market. Colombia is certainly an ideal destination for all types of franchises, this type of business model came before the 90’s to stay, and to further boost the Colombian economy.